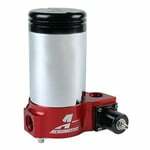 This Aeromotive fuel pump delivers 350 gph of fuel at free flow, enough for engines between 500 and 2,000 hp. They use a diaphragm-controlled regulator for even, reliable flow without sudden pressure spikes. The results are more consistent ETs and better overall performance. Compatible with gasoline and alcohol, the pumps feature a diaphragm bypass, -10 AN inlet and outlet ports, a -8 AN return port, a 1/8 in. NPT gauge port, and a proprietary shaft seal design. Has integrated bypass regulator with -8 AN return port.